Hi there Blogowers – I trust this finds you well? For those who’ve just jumped on board, I’ve been talking about change from within i.e. change is an inside-out process and it IS possible to carry your own weather with you. It’s astonishing what you can influence and you don’t have to be a victim of circumstance. In my last blog I gave an overview of the seminal work of Stephen R Covey, “The 7 Habits of Highly Effective People”. In this blog I‘ll introduce some guiding principles which underpin the whole book and we’ll take a look at Habit 1. But some paradigms die hard. In business, for example, the paradigm of ‘command and control’, of hierarchical structures, has served us well for many years. But in the global economy, people increasingly expect their knowledge to be tapped into; some call it the ‘knowledge worker’ economy. It taps into our mental creativity and seeks to appease our higher needs associated with meaning and purpose. Command and control won’t serve these needs for much longer! We must all change our paradigm of business if we are to survive. OK so you now know what a paradigm is, OK? This links nicely into the next idea of principles. A principle in this context is a natural law. It transcends all cultures, beliefs and values. It has to be right. OK, let’s use a simple example. When you grow tomatoes, you need certain conditions right? You need fertile soil, light, water, an atmosphere at a certain temperature etc…. These things are principles for growing tomatoes. Even if you don’t like tomatoes, you know these things are needed to grow them. Not liking tomatoes would be a value you hold about them. Everyone can have different value sets, but principles hold true whoever you are. Goddit? As an example, if I think of you as lazy, I will treat you as such. Should I be surprised if you continue to be lazy? However, if I believe in your abilities, this will show up in how I behave towards you and you are more likely to rise to the challenge of showing me that you are capable of better things. This may not happen over night, but the 7 Habits are a long term development programme, so don’t expect instant results. Try it. Change your paradigm of somebody with whom you don’t see eye to eye and see if you get different or better results from them. OK, so those are the founding principles. 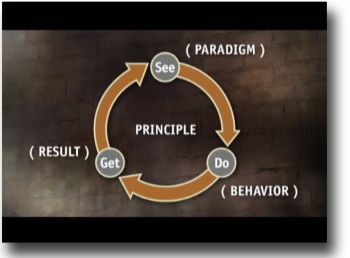 Now lets’ take a look at Habit 1; Be proactive; the first within the ‘private victory’. This is the habit of choice i.e. you are the product of your choices. Believe it or not, nobody can make you feel a particular way. Only you can feel the way you do. How many times have you said to yourself “xxxx has put me in a bad mood”. Well, I have some news for you. You’re the only person who can be in the mood you are. The trick is to learn to give yourself some space between the stimulus (what someone or something does to you) and your response (your thoughts and behaviours). I’m not saying this is easy. We’re all human after all and we’re conditioned towards flight, fight or fright. But as intelligent human beings, we have the capacity to be more considered in our actions if we wish to build lasting relationships with others. Ever responded in haste to an e-mail and regretted it? Next time you feel that way, write your reply in anger and stick it in the ‘outbox’. Sleep on it and go back to it the next day. You’ll probably re-read it and amend it to sound more conciliatory. This is the gap between stimulus and response and can be enormously powerful in building better relationships. By being proactive in this way, you are more control of the things you can influence. 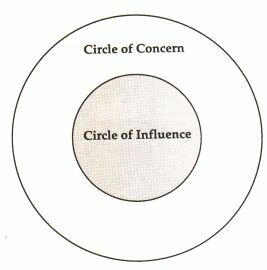 Covey uses the concept of a circle within a circle; the circle in the middle is the circle of influence (with you in the middle) and surrounding that is the circle of concern (things over which you have no control). For example, your relationships with others might be in your circle of influence and climate change might be in your circle of concern. But the more things you can bring into your circle of influence (and therefore expand it), the more effective you become. So there you are peeps. We’re off the starting block and we’re well on the way to succeeding in the private victory – the self-mastery bit (you may remember that from the last blog). In the next blog, we’ll cover habits 2 and 3 which will complete the private victory. Hi folks. I hope this blog finds you well. No I mean it; really. I know people say it as a turn of phrase, but I genuinely mean it. You see I have realised how important it is to stay fit and well, healthy and happy. Again, I know people say that and as I write it, it sounds like common sense, right? But do we really stop and think about what that actually means and more importantly, how we can make it happen? I was recently fortunate enough to have been on the signature programme for Stephen R Covey’s “7 Habits of Highly Effective People”. I also feel privileged to have been accredited as a ‘facilitator’ for the programme, which is very exciting. Some of you who know me or have read some of my previous blogs will have heard me speak about this excellent course and book. I can’t lay claim to it having changed my life (yet) but I can feel something is changing for the better and it feels great. For now, let’s call it ‘potential‘. Stephen Covey himself freely admits that none of his book is his original work. All he has done (I say ‘all’ like he knocked it together in a few days; it took him years of research) is gather together ideas and knowledge from amongst those he believes to be effective at building relationships with others. After all, that’s how we thrive and survive in this world, right? Covey has identified 7 key mindsets or behaviours, or ‘habits’ (in as much as you have to learn some aspects of them to the point where they’re natural and you don’t think twice about them) which if used frequently will enable you to build effective and lasting relationships with friends, family, colleagues and others. This in turn gives you meaning and purpose in your life and gives you a greater sense of belonging and well-being. To get you thinking about why it is important to learn new habits, try this simple exercise. Without thinking about it fold your arms and note which arm is naturally on top. OK now unfold your arms and re-fold them but with the OTHER arm on top. How does it feel? A bit odd? Unnatural? Let’s suppose that exercise is a metaphor for behaviours which may feel a bit unnatural for you, but for building relationships can be really effective. That’s what the “7 Habits” is all about. Empathic listening is probably the single biggest thing I have learned which has helped me in recent years and it’s probably a learned behaviour for many of us. It certainly was for me! Habit One; Be proactive – the habit of choice i.e. we are the product of our choices. Habit Three; Put first things first – the habit of managing time with integrity and execution (this has been the most helpful to me) i.e. we should put important (rather than urgent) things first. These first three habits are what Covey calls ‘the private victory’ i.e. it’s about self-mastery. Habit Four; Think win win – the habit of mutual benefit i.e. there is plenty out there for everybody. Habit Five; Seek first to understand and then to be understood – the habit of mutual understanding (my favourite and SOOOOOO powerful) i.e. we listen to others with the intent to understand and then to be understood ourselves. Habit Six; Synergise – the habit of creative co-operation (needs a bit of explaining but very rewarding) i.e. together we can create a better way than either of us originally thought of. These second three habits are what Covey calls the ‘public victory’ and are all about interdependency i.e. building relationships with others and fulfilling your potential. OK so where does the health bit come in I hear you ask. Habit Seven is called ‘Sharpen the Saw’ and embraces the other six habits. The analogy comes from the notion that if you try and continue cutting trees with a blunt saw, the work becomes harder and harder. Have you ever been too busy driving to stop and get petrol? Well ‘sharpening the saw’ is all about ‘renewal’; making time for yourself, eating well, exercising etc… Again it’s all stuff we know about and that we should do, but sometimes we put it into second place in preference to hitting our targets or making ends meet. If we’re not fit and healthy, there’ll ne no point in making the ends meet because we won’t be around to reap the rewards of meeting them! Part of learning about the seven habits for oneself is to teach it to others in your own words. So what I’d like to do is use this blog over the next few weeks to try and summarise each habit in a bite-sized way, hopefully enough to whet your appetite to look at this seminal work in more detail but also, in some way, to make an important and positive contribution to you and your well being. I’m not an commission but when you read this book or learn more about the ‘7 Habits’, you’ll understand why I, like Covey himself, feel compelled to share these ideas with other people. I’d certainly like to know what you think. Some of you may have seen my previous blogs about change and embracing it. I’ve switched blog sites to WordPress so this is my first one on here and for a while. I’ll keep this one brief. I think of myself as a ‘change agent’ because I firmly believe that in order to bring about the changes you wish to see in your life, only YOU can do that. It’s very easy to adopt the ‘victim’ mentality and believe the world is ‘out to get you’. I have some news for you. You’re wrong! Take my proffesional work. My industry is steeped in a very traditional ‘machine-like’ culture, which (I think) stems from World War II. Bringing about change is hard and scary and many people in our industry (transport) are resistant to it. But I’m starting to notice (and what’s more feel for myself) a change in many of the projects and initiatives I’ve been involved with and in a good way. This is despite the challenging times we find ourselves in. Those of you who know me well understand my passion for great customer service. Well, after many years of camapaigning and pushing for change on these types of intiatives, those who were initially resistant are now quietly but deftly pursuing the direction I have been talking about for many years. In effect, they’re saying “you were right”. Some are even admitting it to me, privately of course. I’m not pushing for change to be ‘right’; I’m pushing for change because I believe we can improve the lives of hundreds of thousands if not millions of Londoners. That’s why I get out of bed every day and that’s what gives me meaning and purpose in my life. I also understand I’m incredibly lucky to be in a job where I can fulfil my ‘higher’ needs. My mantra is ’embrace change; it’s with you for life’. Happy days one and all.